Home » Azure Data Platform » Pro-Tip » Pro-Tip | How to get a free trial of Azure subscription? Do you want to learn and explore Azure? Obviously yes, that’s the next big thing out there and after all, everybody is talking about Cloud so why not dive into this coolest thing and try it out. But to explore Azure Subscription. If you want to start playing with Azure but billing is holding you back then Free trial Azure subscription is the key to your problems. Microsoft Azure is giving away free trials from the very beginning but not many people are aware about it. Let me help you know more about it. You know what’s so cool about Microsoft? MS is giving a chance to look & feel Azure with a free trial subscription to everyone that means even if you are not very versed about cloud technologies and know nothing about it you can also register and start taking advantage of this one time free trial subscription where you get a chance to look, feel & explore the portal & its features that too without worrying about billing. So hurry up, get your Azure subscription Now! 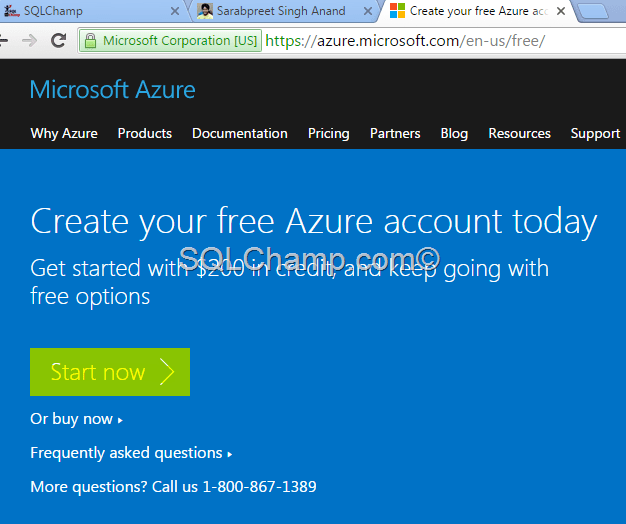 How to get Free Trial Azure Subscription? I know you must be thinking it’s kind of Unbelievable, isn’t it? & there has to be a catch. If that’s your thinking so leave all your thinking’s aside because there is no catch. The only thing you should know is it will charge a one time fee of 1$ that’s it, that too, just to verify that you are a legitimate user and not a robot. Once you are verified it will provide you a Credit worth 200$ which you can use to explore Azure. So getting 200$ is an AMAZING Deal! A lot of users will have this question: Why is my credit card being charged $1 for signing up for the Free Trial offer & what will happen to my 1$? To ensure a valid credit card, Microsoft will charge your credit card $1 when signing up for the Free Trial Offer. This is only an authorization hold, the charge will be reversed within 3-5 business days. Don’t delay further register today @ https://azure.microsoft.com/en-us/free/ and start exploring the greatness of Azure. Difference between SQLAzure and SQLServer in Azure VM? How to create a new database using SQLAzure?